After much waiting and nail-biting we finally received notification this morning that our Bus Service Operators licence has finally been granted. Our small team of trustees have been working tirelessly over the last six months raising funds and preparing our marketing for us obtaining an Operator’s Licence. We have done much since we started operating in May of 2017 when we addressed the fact that commercial operators had abandoned the midday services to Edinburgh. We took up the challenge and introduced the first scheduled Bus Service in Scotland, delivering a regular service between Bo’ness and Edinburgh. On the back of our success, Citylink supplemented our service by diverting the 909 to go via Bo’ness although they miss out the Town centre and the rural communities of Mannerston and Blackness.A measure of our success is that we have delivered over 5000 free journeys to holders of concessionary bus passes, helping us to achieve one of our key goals. The delivery of a service that helps to overcome the isolation felt by many of our older citizens whose links with family and friends had been lost by the cuts imposed by commercial operators. 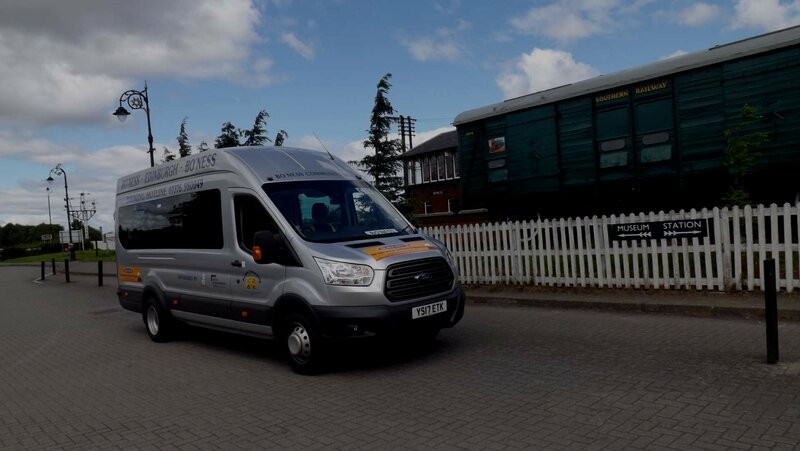 We have also carried numerous passengers with young children and young people travelling independently. We have also had considerable success in promoting Bo’ness and Blackness as Tourist destinations and have developed partnerships with Bo’ness and Kinneil Steam Railway, Visit Scotland and Blackness castle, The Falkirk Trust, the Hippodrome, Kinneil House and the John Muir Way. This has led to an increase in passengers coming from Edinburgh to Bo’ness and Blackness, helping to offset some of our costs and move towards sustainability. Obtaining the Operator’s Licence means we can now address our operations. We intend to review our timetables to provide the services you want, so if you have any suggestions or comments on any failings you may think we have, this is your chance to raise them. Subject to approval by the Traffic Commissioner we intend introducing an early morning service for those commuters that have to start work earlier in the morning, this service will go directly to Waterloo Place via the Gyle with no stop off at Blackness, this should take about 10 – 15 mins from the journey. We will also be reviewing some of the existing start times from Bo’ness and Edinburgh to allow for improved scheduling. Our Operators licence mean we can increase our availability for Hires and be included for Public Service Contracts, this will be aided by the delivery of a new minibus in late August. Remember this is your service specifically for your Community. LOOK OUT FOR NEWS OF OUR NEW TIMETABLE. Booking service available Monday to Saturday from 08.00 am to 17.00 pm or anytime by text.